23red alongside NHS Blood and Transplant (NHSBT) have launched an innovative new campaign across the Clear Channel Digital Out of Home network. The campaign uses live data from local donor centres alongside images of real blood recipients, with the aim of normalising blood donation and making it more personal and local. The first party data from NHSBT is used dynamically to make people aware of the volume of appointments available that day or week at their nearest donor centre. It also shows its location, walking distance, the volume of first-time donors seen there in the past week, and the number booked to give blood that day. The innovation in this partnership comes from the immediacy, locality, and relevance of the data. The work targets people specifically in their local area and provides a suite of real-time information and data which supports the call to action to give blood. The use of first party data combined with the sheer volume of dynamic elements in this campaign is unprecedented in its complexity. In doing so, it seeks to encourage people to visit their closest permanent donation centre, as opposed to relying on mobile donation centres, by making them more aware of how many other people are donating, are planning to donate, and just how close these centres are to their workplaces and homes. The digital Out of Home ads also feature photographs of real blood recipients, shot by renowned photographer, Dylan Collard. The images reflect the diverse audiences that NHSBT needs to reach and include photos of a black man and woman to try and inspire more black donors to help treat those with sickle cell disease, and an image of a mother and child, conveying the need for blood during childbirth. 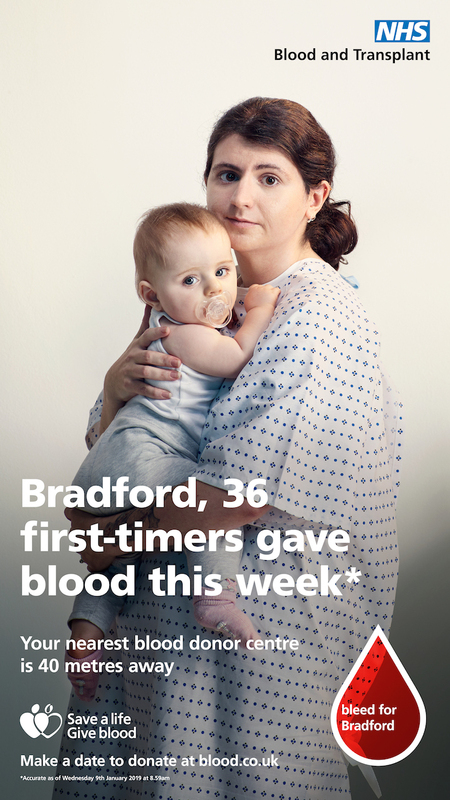 The campaign has launched across 100 sites in close proximity to permanent blood donor centres in Leeds, Sheffield, London, Liverpool, Birmingham, Gloucester, Bradford and Poole.